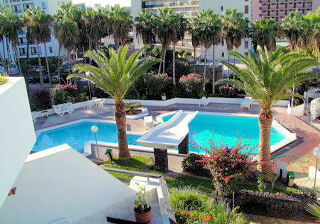 Las Flores is a quiet, exclusive and residential complex situated in the San Eugenio Bajo area of Costa Adeje. It is in an ideal location, being just 2 minutes walk away from the sea front, restaurants, bars and shops. It is a pleasure to relax by the pool or go for a swim as the complex is well kept. Suitable for families or couples. The shared pool is not heated. A car is not necessary, but if you choose to hire a car, there is parking available, if requested in advance.